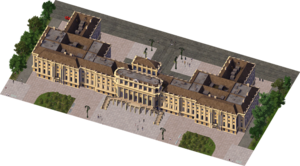 Schloss Schoenbrun is a downloadable Landmark Building for SimCity 4 Rush Hour/Deluxe, released as the Plugin Pack 00E free Downloadable Content. It is a recreation of the Schönbrunn Palace in Vienna, Austria, Originally constructed as a Mansion in 1548, roughly as it appeared in 2003. The News Ticker fluff entry created on its placement is "Schloss Schoenbrun Give(sic) #city# Rooms to Spare".